Big-D Construction, of Salt Lake City, Utah recently took ownership of a new 110-ton (100-mt) 110RT rough terrain crane for a project in northern Utah. 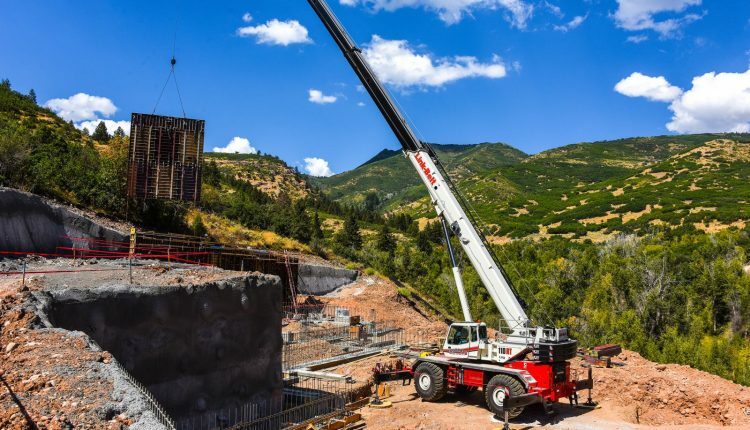 In order to accommodate the requirements of the 30-acre jobsite in a ravine in the Wasatch Mountains, Big-D Construction needed a crane with a small footprint with excellent reach to place over 280,000 sq. ft. of heavy PERI forms for 18 in. (45.7 cm) thick reinforced concrete foundation walls. “I asked for the 110RT specifically since we used Link-Belt machines in the past in this configuration. We used the 90-ton (RTC-8090 Series II) on other projects, and we’ve used the 130-ton (RTC-80130 Series II), so we wanted the 110RT on this project, knowing what it could accomplish. The RTC-8090 Series II worked in Montana in the winter at about a 9,000 ft. (2 743 m) altitude and it did a great job. Here, we are only about 6,800 ft. (2 072 m) high, with hot and windy summers and snow comes early,” said Superintendent for Big-D Construction, Shaun Boydston. Construction on the mountain location requires crew on the ground to move around a lot of materials from a single delivery point on the jobsite. Other requirements include pouring concrete, placing rebar columns for heavier construction, and lifting and placing up to 13,000 lb. (5 896 kg) panels that measure 24 to 30 ft. (7.3 to 9.1 m) wide and up to 34 ft. (10.3 m) tall. “We have to ensure we have enough range and capacity to get to where the crews are working. We build our way out, reaching back to the hillside where the formwork is ongoing. We are working at about a 130 foot (39.6 m) radius with large panels. We basically set the machine inside the footprint of the building. The crane’s boom is fully scoped to 164 feet (50.0 m) for hours at a time to make sure we give ourselves enough range and capacity,” Boydston explained. Over 560 panels are placed when working on the back foundation wall nearest to the mountain. Forms weighing between 1,500 to 5,900 lbs. (680 to 2 676 kg) must be placed at a radius up to 127 ft. (38.7 m). Complete control was needed over the panels as they are placed at the base of each wall to start forming the two-story, 12-unit building. Native grass roofs will finish off the units as not to appear as typical ‘roof tops’ but as part of the natural landscape.